WCD Karnataka Recruitment 2019 – Apply through Online for 163+ vacancies of Anganwadi Workers & Helpers posts: Women Child Development Department, Karnataka recently released a job notification on its official website anganwadirecruit.kar.nic.in for Anganwadi Workers & Helpers posts. Candidates are allowed to apply for WCD Karnataka Recruitment 2019 from 02-03-2019 to 22.03.2019, 27.03.2019 & 31.03.2019. Candidate can find the further details like Eligibility Criteria, Age limit, the Selection process of WCD Karnataka Recruitment 2019 on the below page. Job Seekers can apply for the post through the Official page anganwadirecruit.kar.nic.in and careers99.com. Interested Job Aspirants who are ready to apply for Women Child Development Department, Karnataka 2019 Notification must possess the below-given Eligibility Details. First of all, Open Official Website i.e., anganwadirecruit.kar.nic.in or Below Mentioned link from careers99.com Website. WCD Bidar Recruitment 2019 – Apply through Offline for 131 vacancies of Anganwadi Worker, Helper posts: Women & Child Development Department recently released a job notification on its official website anganwadirecruit.kar.nic.in for Anganwadi Worker, Helper posts. Candidates are allowed to apply for WCD Bidar Recruitment 2019 from 19-01-2019 to 18-02-2019. Candidate can find the further details like Eligibility Criteria, Age limit, the Selection process of WCD Bidar Recruitment 2019 on the below page. Job Seekers can apply for the post through the Official page anganwadirecruit.kar.nic.in and careers99.com. WCD Bidar Notification 2019 announced for the vacancies of 131 Anganwadi Worker, Helper on its official website anganwadirecruit.kar.nic.in. Eligibility criteria, Educational Qualifications, Age limit, Selection process, Pay scale and other required details are mentioned below in careers99.com. So candidates who are interested and eligible can apply Offline before the last date of the Notification i.e., 18-02-2019. Interested Job Aspirants who are ready to apply for Women & Child Development Department 2019 Notification must possess the below-given Eligibility Details. Eligible and Interested Aspirants are requested to Download Application Form from Below link of anganwadirecruit.kar.nic.in Website and Submit it to the mentioned Address before the Last Date i.e., 18-02-2019. WCD Karnataka Anganwadi Recruitment 2019 – Apply Online for Supervisor and Helper Posts: Women Child Development Department (WCD Karnataka Anganwadi) has advertised a notification for the recruitment of 317 posts of Supervisor and Helper vacancies. Eligible candidates can apply online from 04.01.2019 to 15.01.2019. Other details like age limit, educational qualification, selection process & how to apply for WCD Karnataka Anganwadi Jobs are given below. Interested Job Aspirants who are ready to apply for Women Child Development Department 2019 Notification must possess the below-given Eligibility Details. Selection of Candidates for Supervisor and Helper posts will be done as per following stages- Eligible candidates will be selected on the basis of performance in Written Exam, Interview. Women Child Development Department Karnataka has Released Notification for 700+ Anganwadi Workers & Helpers Posts in its Official Website i.e., anganwadirecruit.kar.nic.in. All Eligible and interested Candidates can apply Online after reading complete details of the Women Child Development Department Recruitment 2018 | Apply Online 700+ Anganwadi Workers & Helpers Posts @ anganwadirecruit.kar.nic.in. careers99.com provides full details like Educational Qualifications, Experience, Job Profile, WCD job Pay Scale Details, WCD Exam Pattern, Syllabus, Age Limit, Selection Criteria, Admit Card, Results, Exam Date etc., Aspirants and Karnataka Govt Job seekers can apply for Women Child Development Department Recruitment 2018 | Apply Online 700+ Anganwadi Workers & Helpers Posts @ anganwadirecruit.kar.nic.in through Online mode before the last Date. WCD Karnataka Recruitment 2018-19 – Apply through Online for 473 vacancies of Anganwadi Helper & Worker posts: Women and Child Department Karnataka recently released a job notification on its official website anganwadirecruit.kar.nic.in for Anganwadi Helper & Worker posts. Candidates are allowed to apply for WCD Karnataka Recruitment 2018 from 21.11.2018 to 27.11.2018. Candidate can find further details like Eligibility Criteria, Age limit, the Selection process of WCD Karnataka Recruitment 2018 on the below page. Job Seekers can apply for the post through the Official page anganwadirecruit.kar.nic.in and careers99.com. WCD Karnataka Notification 2018 announced for the vacancies of 473 Anganwadi Helper & Worker on its official website anganwadirecruit.kar.nic.in. Eligibility criteria, Educational Qualifications, Age limit, Selection process, Pay scale and other required details are mentioned below in careers99.com. So candidates who are interested and eligible can apply Online before the last date of the Notification i.e., 27.11.2018. Interested Job Aspirants who are ready to apply for Women and Child Department Karnataka 2018 Notification must possess the below-given Eligibility Details. WCD Karnataka Notification 2018 announced for the vacancies of 710 Anganwadi Worker & Anganwadi Helper on its official website anganwadirecruit.kar.nic.in. Eligibility criteria, Educational Qualifications, Age limit, Selection process, Pay scale and other required details are mentioned below in careers99.com. So candidates who are interested and eligible can apply Online before the last date of the Notification i.e., 27.11.2018. WCD Karnataka Recruitment 2018 Job alert both Fresher and Experienced can get updated on 05.11.2018 notification on recent Women Child Development Department recruitment 2018 openings @ Karnataka. 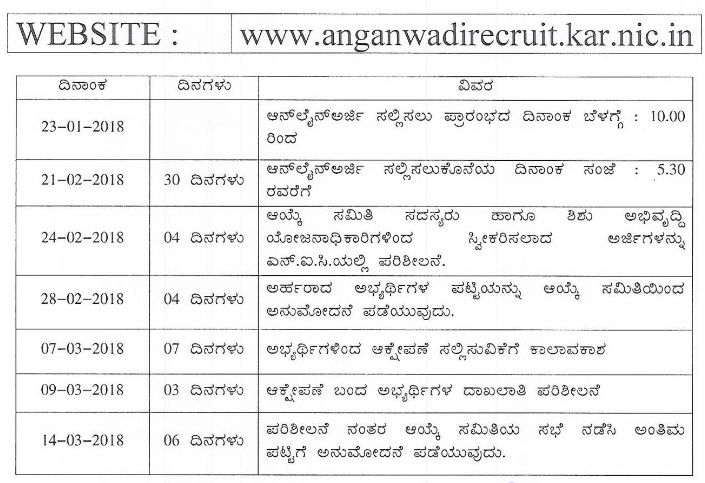 This is an exclusive page updated on 05.11.2018 for the latest recruitment notification anganwadirecruit.kar.nic.in from WCD Karnataka 2018 it contains both active and recently expired Job openings and recruitment notification from WCD Karnataka 2018. Interested Job Aspirants who are ready to apply for Women Child Development Department 2018 Notification must possess the below-given Eligibility Details. Women and Child Development, Chitradurga (Karnataka) (WCD Chitradurga) has released WCD Chitradurga Recruitment Notification-2018 for the post of 54 vacancies for the posts of Anganwadi Worker & Anganwadi Helper. The Recruitment has complete details about their notification on its official website i.e., anganwadirecruit.kar.nic.in and www.careers99.com. This is a good news for those who are waiting for Karnataka Govt Jobs. Candidates may apply offline before the Last date of the Notification i.e., 21.02.2018.And the remaining details for the recruitment like Educational Qualifications, Eligibility criteria, Age limit, No of vacancies, Post names, Pay scale, Job location, Application fee, Important links, Procedure to Apply are mentioned below. WCD Chitradurga Recruitment 2018 – Apply Online for Anganwadi Worker & Anganwadi Helper Posts: Women and Child Development, Chitradurga (Karnataka) (WCD Chitradurga) has advertised a notification for the recruitment of 54 posts of Anganwadi Worker & Anganwadi Helper vacancies. Eligible candidates can apply online from 23-01-2018 to 21.02.2018. Other details like age limit, educational qualification, selection process & how to apply for WCD Chitradurga Jobs are given below. Interested candidates those want to apply for WCD Karnataka Anganwadi Worker & Helper posts must having following educational qualifications. Anganwadi Worker: Aspirants should be SSLC passed from a recognized board/institute. Anganwadi Helper: Candidates must be minimum 4th class and maximum 9th class pass for this post. Minimum age of the candidates should be 18 years and maximum 35 years. The organization may conduct a written exam and/or interview for selection of suitable candidates. Check the notification for each post for more details.